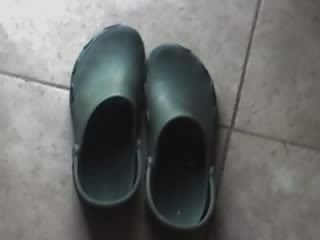 Take my advice, don’t leave your Crocs outside in the sun when it’s 116 degrees or they will shrink. This guy I know, Jonathan, left his Crocs on the back porch of his Phoenix, Arizona home on Tuesday, July 3rd, and on Wednesday evening, July 4th, he went to put them on and claims "they were so tight, I felt like my feet were bound". Everyone knows Crocs are supposed to fit loose and Jon’s did, on Tuesday morning but Wednesday brought degrees of 116 Fahrenheit to Phoenix and now his specialty Crocs, the podiatry comfort shoe, are two sizes too small. So….I don’t think this is much of a warning and I bet if my friend, Jon, were to call and tell customer service what happened they would claim this warning and do nothing about his incredibly shrinking shoes but at least we do know that they can shrink in temperatures of 116 degrees and with Summer in full swing, it might be a good idea to take your Crocs in during the day. My two year old left one of her crocs outside for weeks, we live in CA and the temperature has been in the upper 80s and 90s…even some 100s. Went to put on both crocs after finding the other buried in her room. The one left outside had shrunken so much it looked about an inch smaller than the other! Needless to say we cannot wear them and cannot pass them along to other kids! Wish i knew this also! My croc flip flops were in the car for 3 hours and shrunk 2 sizes!! I wish I had read this before today! My favorite Mary Jane crocs (the ones I could actually wear to work and get away with it) are now at least two sizes too small after leaving them in the car today. Damn! Seriously, who would have thought that Crocs were made with material that could not stand extreme heat. I thought they were the perfect shoe! I left my crocs in the trunk of my car yesterday when it was about 100 degrees in the shade. They must have baked in there, because now they're so small I can't wear them. Googled baked crocs to see if anyone else had this experience. Wow, wish I had known!